Urban gardening has never been more popular and still more people are embarking on this new way of life in the hope of growing their own flowers, herbs, and vegetables. Before long however, people realize that it is not always as easy as it looks. Especially not if you have to combine urban gardening with a busy work life. There are however precautions that you can take! A very good solution to make your balcony or patio teem with life and lively colors is self-watering. This guide will help you make your own self-watering system which is both cheap, discrete, and functional. There are a lot of different self-watering products on the market which all promise that your plants will thrive, such as capillary boxes, self-watering pots, drip irrigation and so on. These are all products that can help you a lot, but they have one major disadvantage; they are expensive! So why not make your own self-watering system? All you need is a trip to the local building store and a couple of hours to put the whole thing together. That’s it. The first thing you need to do is to consider what kind of container you want to use. In this case, I have chosen an old whisky barrel which has a good size and looks very neat as well. 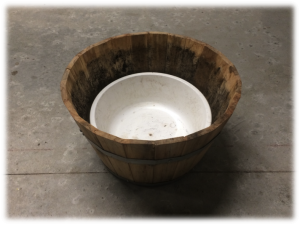 If you choose to use a wooden product such as this, it is a good idea to “line” it with a large plastic bag to avoid it getting into contact with any wet soil. The total cost of these materials is somewhere between 50 and 60 kr. which is a lot cheaper than ready-made self-watering pots. 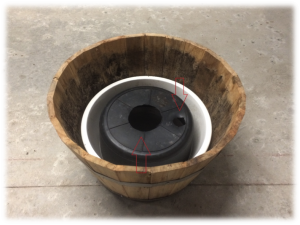 Place the container for the water reservoir inside the barrel or pot like this. Prepare the lid for the water reservoir by cutting it into size. 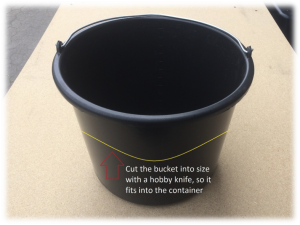 In this case, I have chosen a cheap plastic bucket which is the right size and has enough strength to support the soil which is going to be on top. 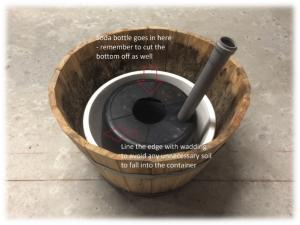 Make a hole in the lid where the soda bottle will fit. While you are at it, you will also have to make a hole for the water pipe. 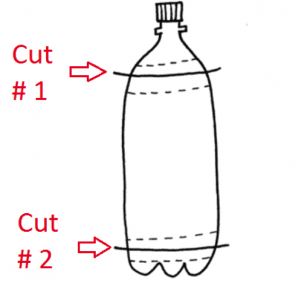 Cut the soda bottle into size. It is VERY important that you make a few holes in the bottle to allow the soil and water to be in contact with one another. Attach the soda bottle to the lid and secure it with some duct tape. Same goes for the water pipe. Line the edge of the lid with some wadding to avoid any unnecessary soil from falling into the water reservoir. TIP: an old wine cork with a stick in it makes a good and cheap indicator of when it is time to refill the reservoir. And there you have it! Now all you need is to fill the barrel with some good quality potting soil, making sure that the soil is pressed firmly down the soda bottle and you are good to go. When you plant your flowers or herbs, you will have to water as if it were a normal pot i.e. from the top. This allows the soil to get properly moist and will make it easier for the capillary system to work next time you water through the water pipe. Not only is this a lot cheaper than buying lots of self-watering pots and capillary boxes. It also allows you to choose the exact design you want. Clorofille offers a nice range of readymade kits to grow your own flowers and herbs. 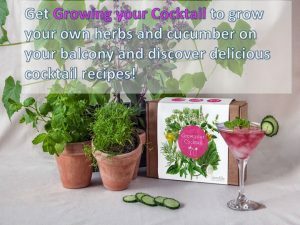 Try for instance our “Grow your cocktail” kit and grow your own herbs and cucumber for refreshing cocktails!